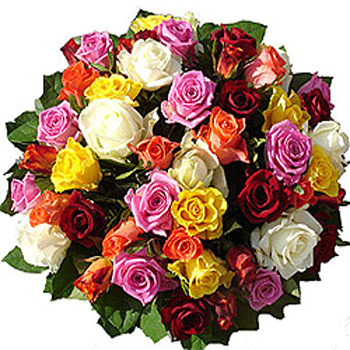 We are proud to offer you this stunning bouquet consisting of thirty five classic roses so fresh and so tender - white, pink, red, yellow and peach. Wonderful gift for any occasion or just because these flowers are meant for your very special someone, she'll be deeply touched by your love and care. Order Rose Paradise and be sure she'll float on a cloud when she sees it! PLEASE NOTE: The colors of flowers in the bouquet may vary depending on availability.